Yarn along – Week 12 – did I say I didn’t like crocheting? 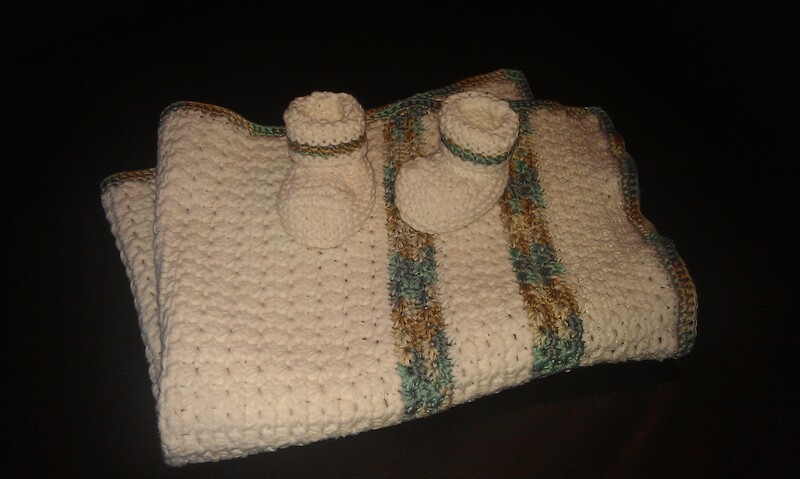 For this weeks Yarn along over at Ginny’s Small things I can show you two finished objects: The crocheted baby blanket and some super cute baby shoes. Funny enough I found a pattern for exactly the baby blanket that I knitted on Ravelry. I hope little Vitus’ mum and dad will like it. Vitus himself will probably not mind at all as he’s only a week old. I just need to put labels on it. Did I tell you? I got myself my own labels. I had a voucher so I thought I might as well spend it on buying labels. They arrived on friday but I haven’t put one get. I will take a picture of the first items with labels for next weeks yarn along. 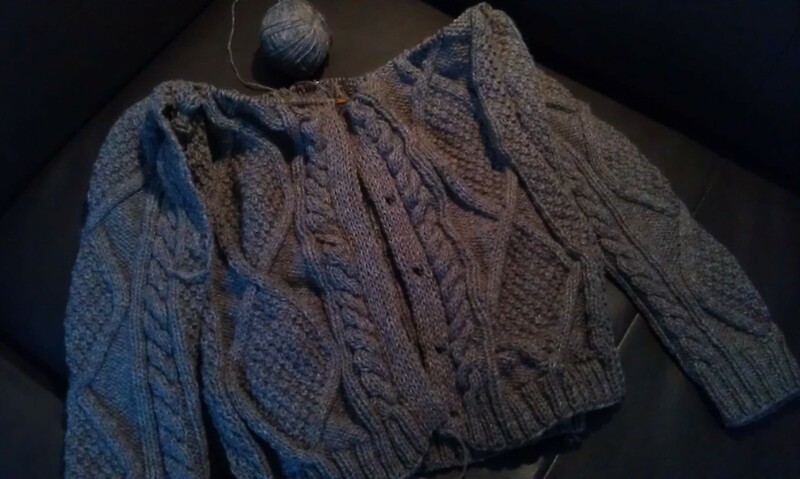 Now, what else do I do: The cardigan is coming along nicely. All five seperate parts are finished now and I have already knitted the first 2 rows of the raglan arm part. This will take a while as I now have to work all around the whole cardigan but I hope to have finished it by the Easter weekend. It was pretty hard to take a picture that shows the cables properly which is why the picture is a little dark. But only like this you could see the Aran pattern properly. Other than that I started with my very first lace piece. 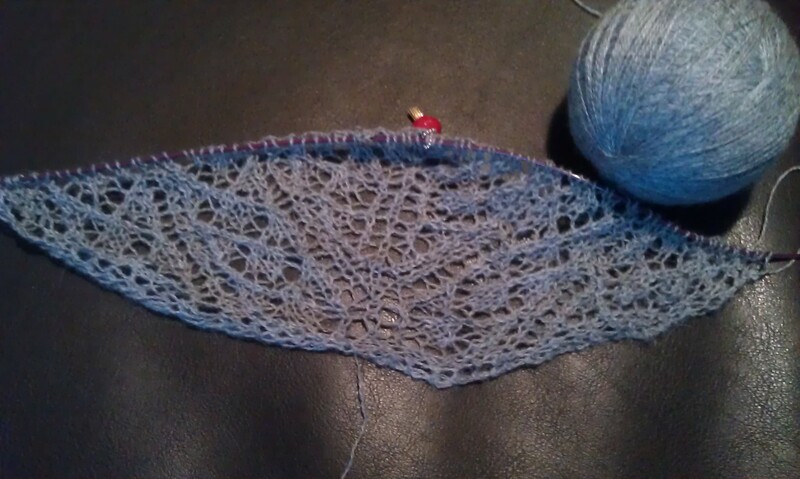 I’m making the lace shawl Filigrano and so far it works out. I’m just not quite sure if it is me doing mistakes every now and then or if it is the pattern because I haven’t figured out why this is happening but I sometimes seem to miss some stitches so that I have to get stitches out of nowhere to make the pattern fit. But as of now I think I managed and it looks great. It will just take a bit of time to get it to a certain size that it is worth having it. Even now it already takes a lot of time to do a row. And I got my very first work phone last week so that now I can check my mails and get calls even when I’m not in the office… yippih… Well, I can switch it off after office hours, so I don’t worry that much. But that means also that I need some protective cover for the phone as I have the tendency to cratch my new phones straight away. 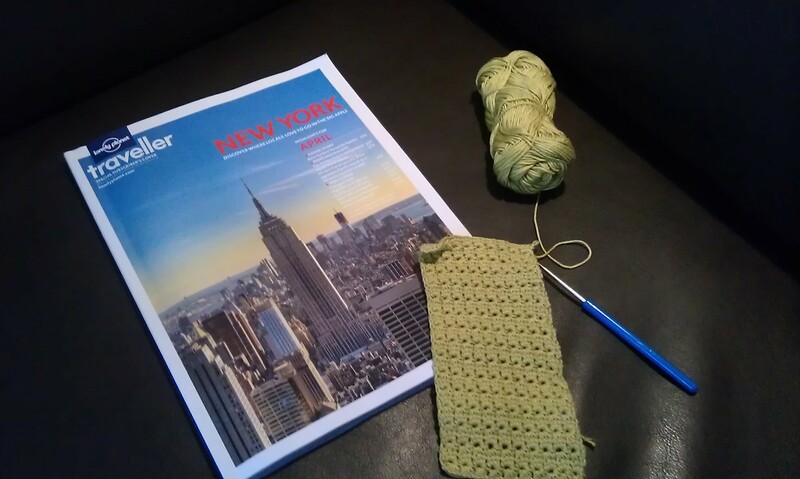 This is why I started crocheting a star stitch mobile case. Against my normal behaviour at the moment I really enjoy crocheting. The star stitch looks great. Reading wise I still read what I read the last weeks. And I got the new Lonely Planet Traveller Magazine. I always enjoy reading it to get some travel inspiration. This entry was posted in Knitting & Crocheting and tagged Blanket, Cardigan, Crochet, Knitting, Lace, Lonely Planet, Magazine, Yarn Along by kathatravelling. Bookmark the permalink.